Today I got chance to talk with one of these heroes from Dera Sacha Sauda named Rajinder Sachdeva Insan. Talked about his experience, feeling and inspiration. Role of Saint Dr. Gurmeet Ram Rahim Singh Ji Insan in inspiring youth. Few weeks back we told you about the True Blood Pumps of Dera Sacha Sauda, the real heroes without any cape, having an exceptional spirit for blood donation. I always wanted to know what these volunteers feel while donating blood? What's the secret behind their enthusiasm and dedication? Luckily, today I got chance to talk with one of these heroes from Dera Sacha Sauda named Rajinder Sachdeva Insan. His name itself tells a lot about his personality, "Insan" (human) was not part of his name from birth, he attached Insan after deciding to be an activer participant in selfless humanitarian services. Till now he has donated blood over 53 times and has pledged to continue for as long as possible. When asked about his first time when he donated blood, he told that he is a Dera follower since childhood and was aware about need and importance of blood donation as his Guru Gurmeet Ram Rahim Singh talks about humanitarian services that we should do for others, for ourselves and for God. He wanted to donate blood since always, he got his first chance in 2001 when his age was just 15 years. He knew he must be above 18 but the situation kind of demanded it and he took step forward for this great cause. He also told us how much confident he was even while donating blood for the first time at such a small age, he said it was possible only because of his Guru Dr. Gurmeet Ram Rahim Singh Ji. I feel quite happy while doing it, its like playing my part for society, it's like our duty towards our God. Saving a human life can't be compared with anything, literally anything. He told that Dr. Ram Rahim has inspired millions to become a regular blood donor, it's the true charity one can do which is beneficial for both the donor and the receiver. Being a regular donor he donate blood 3 to 4 times a every year and hasn't felt any problem physically or mentally, in fact he says this practice has improved his health. 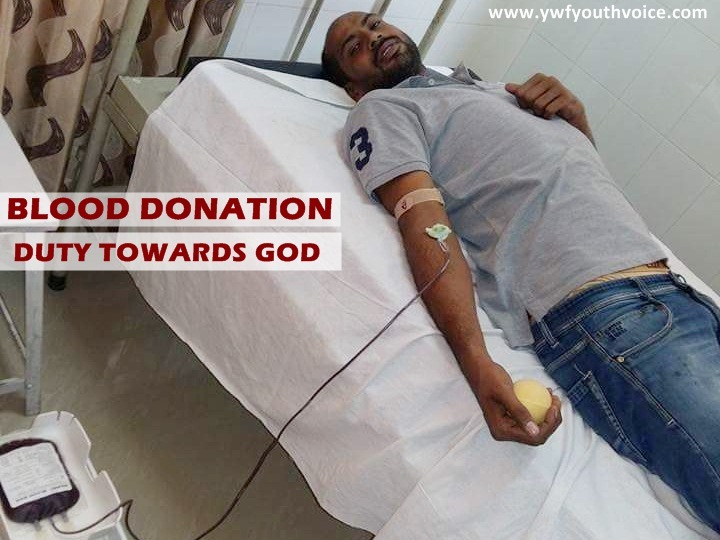 He appealed all the youngsters out there to do their duty towards God and the society by donating blood. Where this Inspiration comes from? On asking this he smiled and said said "M-S-G" his guru, Dera Sacha Sauda chief Saint Dr. Gurmeet Ram Rahim Singh Ji Insan aka Dr. MSG, he told that his guru Dr. MSG has been inspiring people towards this noble cause since decades and this is the reason why Dera Sacha Sauda is the largest blood donating organization of the world, this organization also fulfills the need of blood for Indian Armed Forces. Dera followers hold the world record to donate 43,732 units of blood in one day, Dr. Gurmeet Ram Rahim Singh Ji Insan gave them the name "True Blood Pumps" after seeing the enthusiasm and dedication of the volunteers. These true blood pumps have dedicated all of their work to their Hero The LionHeart Warrior Saint Dr. Gurmeet Ram Rahim Singh Ji Insan.